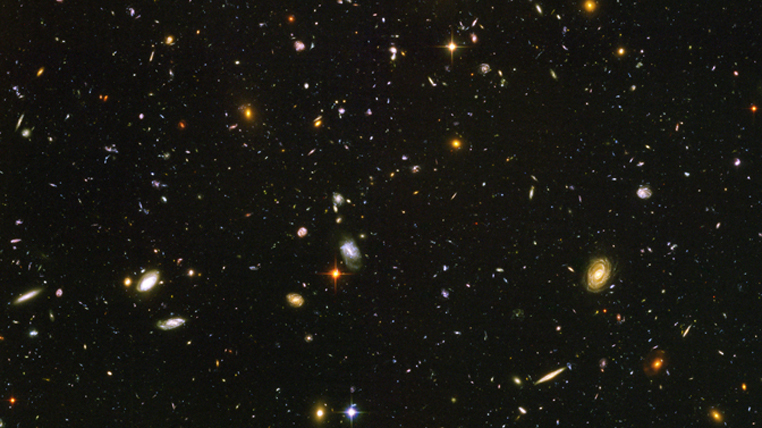 A deep field for the time deaf consists of an animation made from a photograph taken by the Hubble Deep Field team. The animation comprises a long shot of a section of the night sky developing over twenty minutes, set deep within a black box space. It is derived from the length of time it takes the light from distant stars to reach us. Initially blackness is dominant and one or two twinkling stars appear, gradually more stars emerge from the darkness and dot the field of view. Finally tiny galaxies and pulsars start to appear and a vivid coloured palette of stellar activity fills the screen. Powerfully contemplative, the animation is a reminder that the only time we can directly experience the past is when we look at the night sky. “Some few people are born without any sense of time. As consequence, their sense of place becomes heightened to excruciating degree. They lie in tall grass and are questioned by poets and painters from all over the world...Yet the time-deaf are unable to speak what they know. For speech needs a sequence of words, spoken in time.“ Alan Lightman, Einstein’s Dreams. Image courtesy of NASA, ESA, S. Beckwith (STScI) and the Hubble Deep Field team.